Dr. Adams was a farrier for 8 years while obtaining his undergraduate and veterinary degrees. After graduation from veterinary college, he completed an internship at an equine hospital in Colorado. Dr. Adams then practiced for 1 year at an equine hospital in Utah, before moving to Florida to begin his surgical training. He completed his surgical residency at the University of Florida in 2005. 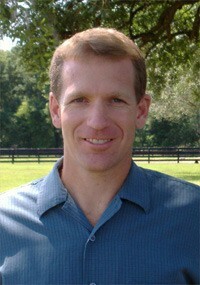 After working in Tallahassee and Brandon, Florida as an associate equine surgeon, Dr. Adams joined Equine Medical Center of Ocala in 2006. Aric and his wife Teresa and their two children, enjoy the beautiful Florida outdoors, horseback riding, kayaking, scuba diving and fishing.